Discover the world of the Queen's Thief New York Times-bestselling author Megan Whalen Turner's entrancing and award-winning Queen's Thief novels bring to life the world of the epics and feature one of the most charismatic and incorrigible characters of fiction, Eugenides the thief. Megan Whalen Turner's Queen's Thief novels are rich with political machinations and intrigue, battles lost and won, dangerous journeys, divine intervention, power, passion, revenge, and deception. Perfect for fans of Leigh Bardugo, Marie Lu, Patrick Rothfuss, and George R. R. Martin. Eugenides, the queen's thief, can steal anything-or so he says. When his boasting lands him in prison and the king's magus invites him on a quest to steal a legendary object, he's in no position to refuse. The magus thinks he has the right tool for the job, but Gen has plans of his own. 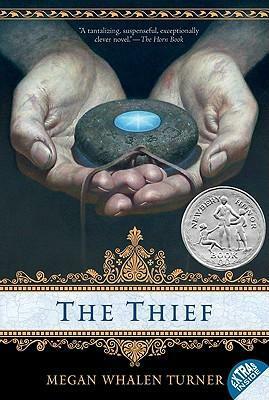 The Queen's Thief novels have been praised by writers, critics, reviewers, and fans, and have been honored with glowing reviews, "best of" citations, and numerous awards, including the Los Angeles Times Book Prize, a Newbery Honor, the Andre Norton Award shortlist, and the Mythopoeic Fantasy Award. Discover and rediscover the stand-alone companions, The Queen of Attolia, The King of Attolia, and A Conspiracy of Kings, all epic novels set in the world of the Queen's Thief. A Newbery Honor Book An ALA Notable Book A YALSA Best Book for Young Adults A Horn Book Fanfare Book A New York Public Library Book for the Teen Age A Bulletin of the Center for Children's Books Blue Ribbon Book A Junior Library Guild Selection "The Queen's Thief books awe and inspire me. They have the feel of a secret, discovered history of real but forgotten lands. The plot-craft is peerless, the revelations stunning, and the characters flawed, cunning, heartbreaking, exceptional. Megan Whalen Turner's books have a permanent spot on my favorites shelf, with space waiting for more books to come. "-Laini Taylor, New York Times-bestselling author of the Daughter of Smoke and Bone novels and Strange the Dreamer "Unforgettable characters, plot twists that will make your head spin, a world rendered in elegant detail-you will fall in love with every page of these stories. Megan Whalen Turner writes vivid, immersive, heartbreaking fantasy that will leave you desperate to return to Attolia again and again."